How Do I Clean My Walther P.38? 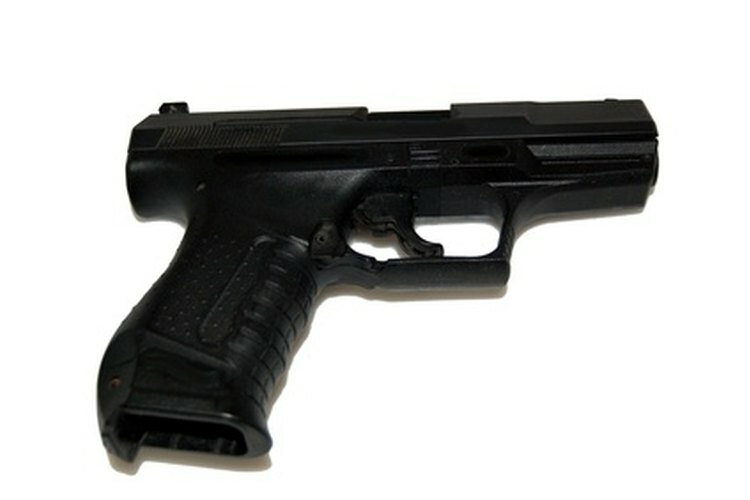 Walther is a German company that has been making firearms since the late 1800s. Although the original Walther factory was destroyed in World War II, Walther rebuilt its factory and was back in business by the early 1950s. The P-38 9-mm pistol, which was developed in 1938 for German troops, is a semi-automatic with a dual-action trigger and removable cartridge magazine. It is still in production as of 2010. To keep your Walther P-38 operating efficiently and safely, clean it periodically to remove dirt, oils and gunpowder residue. Insert an empty cartridge magazine into the cavity at the bottom of the hand grip. Slide the magazine upward until it locks into place. Engage the safety lever by moving the hammer back with your thumb slightly while pushing the safety lever on the side of the hand grip downward with your other hand. Pull the slide toward the rear of the pistol until it clicks into the open position. Remove the magazine by pushing in the release lever at the bottom of the hand grip and letting the magazine slide out. Rotate the barrel catch lever at the front of the hand grip downward until it clicks. Pull the slide to the rear of the pistol slightly and then press the slide-catch button on the side of the barrel while moving the slide forward to remove it from the barrel. Remove the barrel from the slide by pressing on the barrel-locking bolt on the underside of the slide toward the muzzle with your finger. Remove the barrel from the slide. Clean all four parts (grip, magazine, barrel and slide) with gun cleaning fluid and a clean cloth. Lubricate the barrel and the grooves of the slide with lubricating oil made specifically for your Walther pistol. Wipe all parts dry with a clean cloth. Reassemble your Walther P-38 in the reverse order of the take-down to avoid damaging the pistol. According to Walther, any take-down of your P-38 other than described in the steps should be accomplished by an entrusted, skilled craftsman, such as your dealer. Leave your Walther P-38 in its safe mode for the entire take-down and reassembly process.